This was today's project. It's a big ole steamin' pot of Brunswick Stew. I'm sure lots of different people call it lots of different things, but where I'm from, it's Brunswick Stew. I'm willing to bet this recipe came up the way most Southern recipes do- out of necessity. Someone had some leftover chicken or pork or beef from a Sunday roast and decided to do something different with it. This particular version is a hybrid of a friend's mom's recipe and several other recipes I've seen on blogs over the years. I cobbled it together with what I had on hand. Well- technically that's a lie. I had the chicken, but I bought pulled pork specifically for this recipe. And yes, I realize that's a huge cheat, but I don't care. cook something from the region where we grew up. Being from the South, I first thought of fried chicken and macaroni and cheese. But because I work full time, I decided fried chicken for 10 people in the middle of the week might not be realistic. 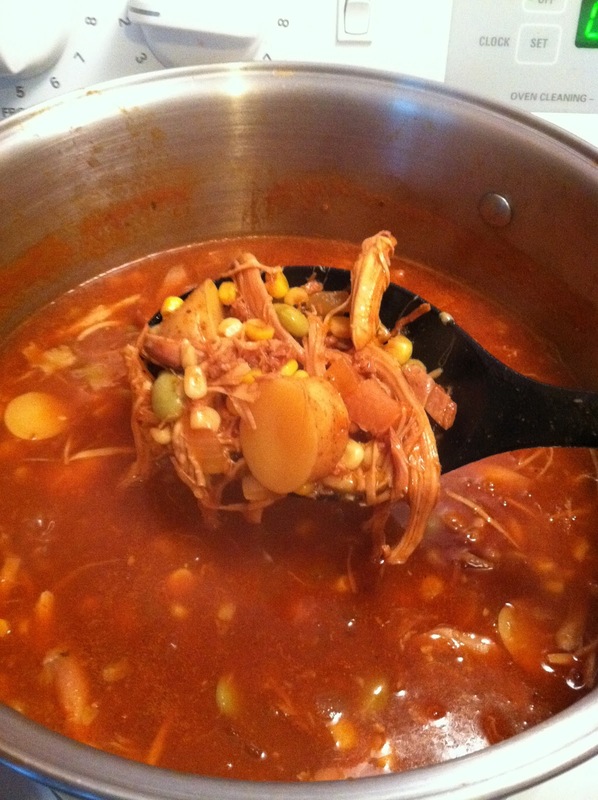 So, I then set my mind on Brunswick Stew. I've never seen it on menus around here, and I knew the people in my club would love it! 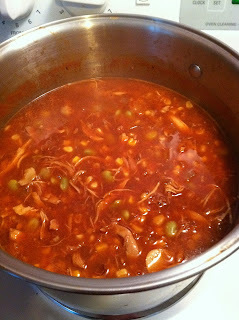 I'll tell you what I put in mine, but if you google Brunswick Stew, you'll see lots of other variations. I started with 2 boxes of chicken stock (another cheat) and poured them in a large stock pot. Then I chopped a large yellow onion and threw that in. I put the pot over medium high heat to get things rolling. Next came a bag of frozen corn and a bag of frozen baby lima beans. I had a bucket of fingerling potatoes from Dev's mom's garden, so those got washed up, chopped and thrown in. I put in a whole bottle of barbecue sauce (I used Famous Dave's) plus the last of the coca cola barbecue sauce I made last week. I added quite a bit of sriracha, because I like it. If you don't, use tabasco, or any other hot sauce you want (or none at all if you are a sissy). Then came the main events.....one container of Lloyd's Pulled Pork and one whole shredded rotisserie chicken. If you want to do this the hard way, you could make the stock for the stew while you cook down a whole chicken. I took the easy way because I didn't have time to go the other route. I bet no one will know the difference! Lastly, I hit it with some salt and pepper- lots of freshly ground black pepper. It has been simmering on my stove for about 2 hours. I'm pretty sure my food club will like it. If they don't, I'll bring it home and freeze it, cuz I LOVE it!